I went to see my doctor earlier this week. I'm feeling fine, but given my sister's recent cardiac issues, I wanted to talk to an MD about it. So, after getting to the office for an 8:40 appt., I finally got in the see her at 10. Since I told my boss I would be in by 9:30, the stress of waiting almost gave me chest pain! Anyway, my EKG was normal. So, that's good. I guess I didn't have a heart attack while I was in the waiting room desperately trying to get my boss on the phone to tell him I'd be late. I will be having blood work done like a complete blood count, a metabolic panel and a lipid panel. 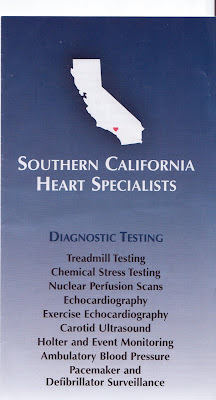 There are other things listed on the blood work she ordered, like TSH ( a thyroid test), Homocysteine ( an amino acid that in high amounts is linked to coronary artery disease) and HgBAlc ( a blood sugar test). That's a lot of vials of blood! Tomorrow, I'm going to have an exercise stress test. I'm hoping the results of that will be good and that my ticker is fine. Otherwise I will have to have the Nuclear Perfusion Scan. And, judging from Cheryl's experience, that test is not too much fun. Good for you Kathy. You're more brave than I, but it's getting to be that time for me as well. Well, it's actually been that the time already, it's just the 'nerve' I'm waiting for. You crack me up....at least you know they got an accurate reading.